in my favorite myrtlewood salad bowl. This is a perfect salad for fall. We made enough to serve about 60 people for our first Think Local Umpqua Benefit Dinner and Concert last Friday. We used organic lettuce from Sutherlin, apples and hazelnuts from Norm Lehne Garden & Orchard, dried Bandon cranberries (which I dehydrated myself! ), and a Marionberry-Pear vinaigrette with local pears and my homemade Marionberry vinegar. The dressing recipe is adapted from one in Thyme and the River by Sharon Van Loan and Patricia Lee. This cookbook is a wonderful collection of recipes and stories from The Steamboat Inn on the North Umpqua River. I often include this salad recipe when I give away a bottle of berry vinegar. Coarsely chop 1/2 cup hazelnuts. I don't worry about removing the skins. Toast in a preheated 350 degree oven for 5 to 10 minutes until their color deepens just a little and they become fragrant. Set aside to cool. Tear up a variety of fresh, crisp lettuce leaves, enough to fill a good-sized salad bowl. I like to use a mixture of different green and red leaf types and a bit of arugula thrown in, if you have it, is good too. Add one apple, diced and 1/2 cup dried cranberries. Add the cooled hazelnuts. Pour about 2/3 of the Berry Vinaigrette (see below) over the salad and toss well. Add additional dressing as needed and a bit more salt as your taste dictates. Serve immediately. 1/2 of a ripe pear, any variety will do. I don't bother to peel it. You can dice the other half and add it to the salad or puree the whole thing and freeze half for another time. I also keep containers of baby food pears on hand for those times I don't have a ripe pear. The 2.5 oz size is perfect for one recipe of dressing. This year I actually canned some pear puree in the little 4 ounce jelly jars just for this purpose! I also froze some in ice cube trays. If using fresh pear, combine all ingredients in a blender and blend until smooth and oil is emulsified. If using baby food pears you can just whisk everything together. Leftover vinaigrette can be stored in the refrigerator for up to one week. 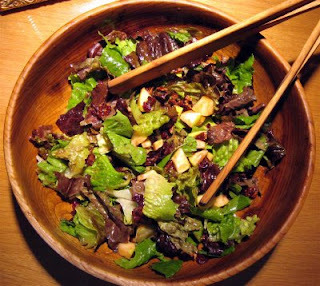 Another variation for the salad--use dried bing cherries and cherry vinegar with toasted walnuts!